Things started out so well. My avid knitter wife told me to Cast On about twenty stitches. No problem, I banged out twenty-four and handed my work to her. She inspected the stitches, assessed the tension, and gave me her nod of approval. 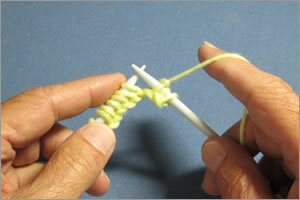 Now it was time for me to learn how to make a Knit Stitch. The first decision that I faced in this adventure was: do I seek help and have my avid knitter wife show and explain to me how to do it; Or do I independently, all on my own, read the instructions for how to make a Knit Stitch from my Knitting Made Easy book? I asked my wife what she thought, but only got back a raised eyebrow. I was at a fork in the road for sure, and I knew that the easier path of the two to take would be to have my avid knitter wife just give me another show and tell. But instinctively, not wanting to be dependent on anyone, I picked up the book and started reading. And I couldn’t help but notice out of the corner of my eye that my avid knitter wife was shaking her head and giving me that spousal look as if to say, “Here we go again”. I get that look a lot. Imagine my surprise, after reading the instructions from my Knitting Made Easy book for how to make a Knit Stitch, when I found myself actually understanding how to do it. The instructions, for once, made sense to me. Step 1: Hold needle and Cast On stitches in your left hand. 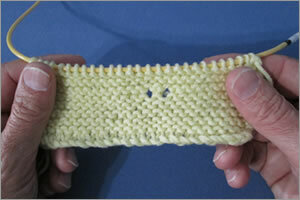 Keeping yarn behind your work, insert right-hand needle from left to right through the front of the stitch. Step 2: Wind the yarn around the right-hand needle from left to right. Step 3: Draw the yarn back through the stitch, forming a loop on the right-hand needle. Step 4: Slip the stitch off the left-hand needle. Repeat steps until all stitches have been transferred from the left-hand needle to the right-hand needle. So easy. So beautiful. My very first row of Knit Stitches. Proudly, I handed my work to my avid knitter wife. Awaiting her approval, I was as surprised and happy as she was when she gave it. Handing the work back to me, she suggested that I knit twenty rows and then show her how I did. 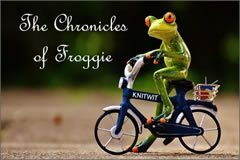 With confidence and swagger, I embarked upon doing just that, knitting another twenty rows. I was anxious to do the work and see the result. I thought I knitted every stitch on every row the same way, and correctly, but my work suggested otherwise. As I looked at my work, there were two holes in my knitting as if my work was looking back at me, and laughing. And as I was taking a count of how many rows that I knitted, I happened to notice that the last row I knitted had two stitches more than my first row of stitches. So in addition to making two eyes, I have made two extra stitches somewhere! Not sure what I had done, I showed my work to my avid knitter wife. She furrowed her eyebrows and asked if I had read ahead in my Knitting Made Easy book and taught myself how to make yarn over increases. I tried to keep a straight face as I considered lying, but she saw through it all and laughed as she realized that I had no idea why my knitting had these two holes in it as well as the extra stitches. So we had a postmortem to discuss what went wrong and then I knitted a few more rows with my teacher, my avid knitter wife, looking on. She quickly spotted that I was still struggling with holding the yarn and maintaining the correct amount of yarn tension. Some of the time, my tension was too tight and I struggled with getting my right-hand needle through the front of the stitch on my left-hand needle. At other times, my tension was too loose and things would fall off one or both of my needles. My wife also noted that my posture was poor. I was quite reclined in my La-Z-Boy chair and I was holding my needles almost horizontally with the tips of my needles pointing at my nose rather than upward in the air. No wonder I had carelessly brought the yarn from the back of my work to the front resulting in those inadvertent Yarn Overs. In short, I needed to improve my grip, posture, and tension. As an avid golfer, this made perfect sense to me as without a good grip, correct posture, and just the right amount of tension, you can’t hit a golf ball very well at all. Knitting is now starting to make sense to me. And I like it. I have only scratched the surface and have a lot more to learn, but I think I am ready to knit something simple and I have a perfect project in mind.